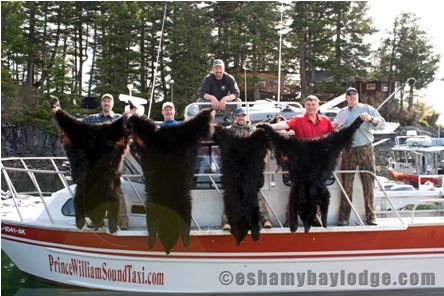 Let us be your headquarters for your unguided Alaska Black Bear Hunt and have the provided Water Taxi transport you and your skiff to Eshamy Bay Lodge. Prince William Sound is said to have the highest concentration of Black Bears in Alaska, and Eshamy Bay Lodge is in the heart of the Prince William Sound. Prince William Sound Alaska black bears are typically found at the shorelines of the Prince William Sound in early spring. Male Bears five to six feet in size weighing 150 – 400 pounds will often emerge from the winter dens first, in search of newly sprouted shore grass and greens. Early spring in the Prince William Sound is usually wet, and cold, with plenty of snow still on the ground. 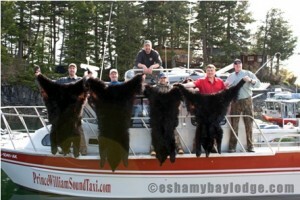 Prince William Sound Taxi can also transport you to other parts of the Sound for Black Bear Drop off Hunts. Choosing Eshamy Bay Lodge as a base camp for your self-guided Bear Hunt will seem like a necessity rather than a luxury after you have seen the early spring camping conditions. 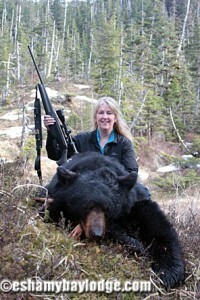 Sleeping in a wet cold den is ideal for producing plush fur coats on lean spring Prince William Sound black bears, but these conditions make for less than a comfortable hunt. Stay in one of our Prince William Sound Rental cabins, enjoying the warm and dry comfort provided by the diesel stove in each cabin. Dine daily on the many fine meals in the cookhouse and at the end of the day take a nice, warm shower to wash off the day’s hard work. Flush toilets, warm showers, and excellent meals in a hunters paradise is what you can expect at Eshamy Bay Lodge. Make your reservation now, space and dates are limited. The Sitka black-tailed deer (Odocoileus hemionus sitkensis) is native to the wet coastal rainforest’s of Southeast Alaska and north-coastal British Columbia. Its range has expanded via transplants, and established populations now exist near Yakutat, in Prince William Sound, and on Kodiak and Afognak islands. Related to mule deer, Sitka black-tailed deer are smaller and stockier than the Colombian black-tailed deer found in the Pacific Northwest. 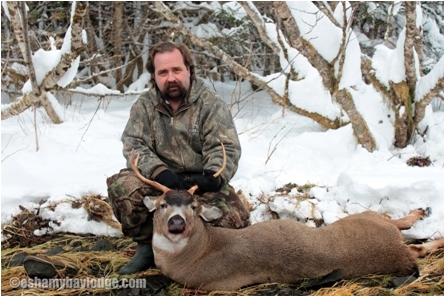 The average October live weight of adult Sitka black-tails is about 80 lbs (36 kg) for does and 120 lbs (54.5 kg) for bucks, although 200-lb bucks have been taken. 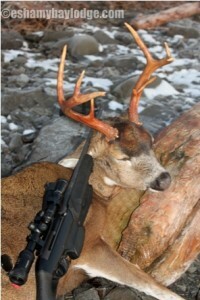 The dressed weight of a 100-lb (45-kg) deer is about 60 lbs (27 kg), yielding about 35 lbs (16 kg) of meat. Our Water Taxi will drop you off at your hunting destination in Western Prince William Sound.